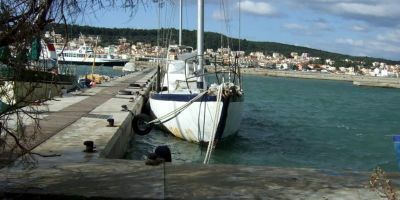 Looking to sail from Kefalonia? Search to find and book your ideal boat, or read everything you need to know: prevailing winds, where to sail, how to get there and more! Kefalonia is one of the most beautiful islands in the world, and it's even better when viewed from the sea - sailing around it's beaches, cliffs, forests and bays is idyllic. 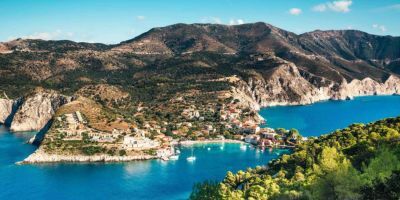 The whole of the Ionian islands are a joy to sail around, with guaranteed sunshine and reliable winds, but Kefalonia is often the island which is the most memorable, and one which you'll have to keep coming back to. From Sami, our base in Kefalonia, you can visit Ithaki (the home of the legendary Odysseus), the beautiful beach villages of Sivota and Meganissi, the fishing village of Astakos, and the pretty architecture of Fiskardo. Some people come to the Ionian year on year - there's nothing quite so relaxing and magnificent as sailing here. Book your yacht charter here today! There’s a wealth of places to set sail to from Kefalonia: touring the beautiful South Ionan islands of Ithaki, Kalamos and Meganissi and the towns of Fiskardo or Argosoli; heading northwards around Lefkas town and Preveza (and onwards to Paxos, Antipaxos and Corfu if you have time); heading South to glorious Zakinthos (and onwards to Kalamata, where you’ll find the best olives in Greece! ); or heading East to Patras, the Greek mainland, and the Saronic gulf. In every direction, you’ll find beautiful islands, cute villages, and great Greek hospitality. An idyllic Greek village, complete with white-washed houses, sandy beaches, white cliffs, clear blue seas, and surrounded by lush green pine forests. A spectacularly beautiful and restful place to spend a night. One of the highlights of the Ionian sea, the home of Odysseus is a stunning place to arrive by sea, with the whole town built around the harbour like a giant amphitheatre – watch out for the Venetian cannons protecting the village! 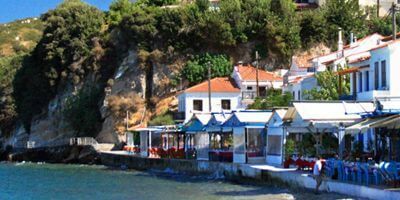 A delightful village stuck in time and tucked between some of the finest beaches in the Ionian sea. Outstanding views and a tranquil pace of life make it the ultimate place to relax! From Kefalonia, or the village of Sami, there’s options to explore more of Kefalonia and visit Argostoli, or to head South to Zakynthos, but most people choose to head around the Southern Ionian islands, where there’s sunshine, good winds, and a fine mix of exciting islands to explore – in fact, there are so many of them, and they’re so close together, one of the issues in arranging an itinerary is finding ways to actually get some sailing done. To that end, this itinerary is 110 nautical miles in total, which, based on 6 days of sailing (the general rule is that you won’t do any meaningful sailing on either the Saturday you check-in or the Saturday you check-out) means around 18 nM a day. Given the Force 3 to 6 winds, you’d expect the average yacht or catamaran to be able to hit speeds over at least five knots, which means that the sailing aspect should only take three to four hours a day – which leaves plenty of time to explore your starting or finishing point each day, or to bimble around, explore bays as you pass them, or take your time to breakfast and lunch at your leisure. All in all, it should make for a relaxing holiday, and you shouldn’t find yourself racing against the clock. Get the provisions and the crew on board, and then it’s time to fire up the motor, slip the lines, and saunter out and away from Sami. Today is a good day to get your hand in on sailing, as there isn’t too much distance to cover, and you’ll be sailing in pretty much every direction at some point. As you’re already fairly remote as far as charter bases go, then you shouldn’t see much by way of the normal Sunday morning rush to get out of the marina, which makes things easy. It’s also a simple enough day for navigation – point yourself out of Sami bay, and you’ll spot another island, which we’re going turn to starboard and follow it’s coastline round (keeping the coast on the port side of the yacht) until we reach our destination. The prevailing summer wind is a North or North-westerly, which follows the coastline of the Greek mainland, so you’ll likely be beating into the wind at first, then reaching around the bottom of Ithaki, then beating back up to the village of Vathi, before reaching and running into and down Vathi bay when you get there. As you head down the bay to Vathi look out for some old cannons which are still in situ from the days of the Venetian empire. They’re pretty dormant now, but just imagine the damage they could do to your modern ship as you sail by. Arriving in Vathi is pretty special – the whole town is built up on the hillside around the marina which makes it feel like you’re almost arriving in the centre of a giant amphitheatre. The island of Itaki (or Ithaca as it is known in English) is most famous for being the birthplace and home of Homer’s legendary Odysseus, who took part in the battle of Troy in 800 BC. Local archaeologists recently discovered a three-storey palace which dates to about the same era and claimed it was once Odysseus’ palace. That suggests that he wasn’t fictional, and, if you believe that, then this week you should look out for sirens, minotaurs and ladies with snakes instead of hair. Vathi has a reasonable range of shops and restaurants to explore. From Ithaki, we’re completing the longest day of sailing which, at 25 nM isn’t too long or arduous a day. After leaving the marina and heading back up the channel, we’re bearing in a North-easterly direction to hit the fishing village of Astakos on the mainland. If time is on your side, you could stop at the white sands of Gidaki beach on your starboard side on your way off Ithaki, or there’s beaches just off Drakonera as you get closer to Astakos. You will likely be broad reaching against the prevailing winds, so your crew can stay seated and rest easy for most of the day. 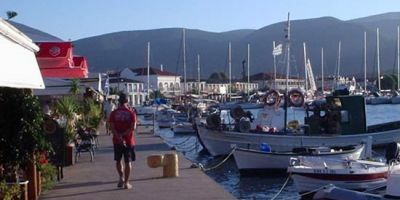 Despite being on the mainland, Astakos is a quiet little village, which, being in the middle of nowhere, is dependent on fishing at sea and growing grapes on land – hence the food and drink here is usually exceptional. They’re a friendly bunch in town, and there are some great beaches nearby. After a relaxing evening in Astakos, we’re sailing in the opposite direction to yesterday and leaving a quiet fishing village for a more lively marina located near a tourist hot-spot. You’ll be sailing South-west to leave Astakos, then reaching up the wind in a North-westerly direction across the South Ionian sea. It’s only 22 nM, which means you might be able to stop for lunch in the bay on the south of Atokos, in the middle of the sea – it’s a well-sheltered bay, and there’s a brilliant beach there. Sivota is at the end of a narrow-ish bay. It’s a beautiful place, with white limestone cliffs, sandy bays, turquoise seas and classic Greek white-washes houses all surrounded by forests of pine. If it wasn’t for the fact that this was popular with land-lubbing tourists, then this would be idyllic. However, the land-lubbers add to the atmosphere as night falls – by day, the village is sleepy, but after dusk the tourists all leave their all-inclusive resorts in search of authentic Greek bars, tavernas and cuisine – which means that evenings can be quite lively, and there’s a strong chance you’ll end up doing some Greek circle-dancing if you have a few drinks. Outside of the bars, it’s a serene and blissful place to spend the night. If you sailed the most direct route from Sivota to Meganissi then it wouldn’t take long at all, but today is all about enjoying the sailing in the sunshine and experiencing the beauty of the Ionian, and we’ll see cliffs, caves, bays and beaches galore as we sail round the South side of Meganissi and to the town of Vathy. If you haven’t already fallen in love with the Ionian, well, this might be the day. We can also take some time to check out a natural wonder near Sivota. Heading pretty much directly East from Sivota, you’ll find the cave of Papanikolis on the coast of Meganissi. This is the second largest cave in the whole of Europe (it’s over 120m long!) and has a history of being used by local sailors to hide from pirates, and, later, as the hiding place for the Papanikolis submarine during world war two. Following the coastline round, there’s plenty to explore on the back of Meganissi, and, in fact, the island is so small that if you dropped someone off on a beach on the South of the island, they could walk across the island to Vathy a lot faster than you can sail there (so they can go and get the shopping in). Vathy is the quietest of the villages on Meganissi, but is also fast becoming a tourist destination in its own right. 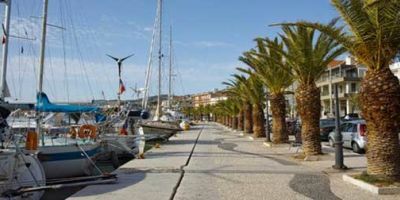 It has a number of tavernas along the waterfront, and is a perfect example of a typical Greek island town. This is what a Mediterranean sailing holiday is all about. 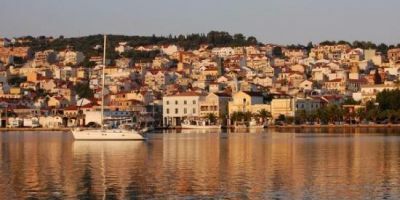 We're completing our 360 degree tour of Meganissi by heading West out of the harbour and dashing South back past Sivota and Papanikolis, and South-West to Fiskardo, back on the island of Kefalonia. You should be running with the prevailing wind as you sail past the island Arkoudi and hold that bearing to the tip of the island on the horizon. Fiskardo is a glamourous fishing village come tourist town with colourful houses and a bohemian atmosphere, and is very popular with sailors. The harbour is right in the centre of town and so close to bars and restaurants that if they were full, you could probably persuade them to walk an extra few metres and get them to serve you on your own boat. It’s a cute town and also an ideal place to stock up on souvenirs of Kefalonia (if you haven’t already). How is it the last day already? The week has flown by, and I hope you’ve enjoyed the views and the sailing. Hopefully everyone in your crew has gotten on with everyone else, you’ve all been pulling your weight, and you’ll be returning home with even better friends than you arrived with. To get back to base in Sami it’s a very straightforward South-easterly sail down the channel between Ithaki and Kefalonia. You could go around the whole of the island of Ithaki if you’re feeling ambitious, but there’s plenty enough bays and places to explore on the short route (such as Agia Sofia or Chorgota beach, amongst others) that you’ll find the day passes by quick enough as it is. You’ll likely be sailing with the prevailing wind behind you too, so you might be running slower than earlier in the week. Take the boat back to the berth where you found it in the harbour, and the charter company will arrange for the tanks to be refuelled by a mobile tanker. Another benefit of not heading to one of the big charter bases is that you won’t be having to wait with tens of other boats in a chaotic queue to use a single fuel berth, so enjoy that. The charter company might come and inspect the boat, but you can stay on it for the night – which means you couldn’t be better located for enjoying the food and nightlife of Sami. If you haven’t yet explored the town, then now is a good time to do so, and you’ll quickly realise that this was the place where they filmed Captain Corelli’s Mandolin (because they certainly don’t make a secret of it). And then it’s the end of your sunny and super-relaxing week. It’s time to get a transfer and an aeroplane and head back to civilisation, which will seem even further from small Greek fishing villages than you can imagine. But don’t worry – you can come back here whenever you choose. It’s great if everyone on the boat is already talking about what you’re going to do next year, and if that’s the case (of course it is! ), then check out some of the other destination guides on PlainSailing.com for some inspiration of where to head for your next big adventure. See you soon! If you could hand-pick the weather for a sailing holiday, you might well end up with the same weather as they get in the Ionian. They have very mild winters (it seldom gets below ten degrees, so no need to own a pair of snow shoes!) coupled with delightfully hot – but not too hot – summers, and dependable winds. Temperatures pick up for the summer from about mid-April, so that it’s around 20 degrees or above from May to September, and peaking in July and August when the average temperature graph hides the fact that temperatures can reach mid- to high thirties in Celsius. It’s also hot in the evenings, so you likely won’t be needing to pack a thick sleeping bag or heavy blankets. With warm weather throughout the year, it’s no surprise that the sea is also quite temperate, and is rarely below 15 degrees – which isn’t far off the maximum sea temperatures you’ll find in the UK. When the sun starts shining in April, sea temperatures rise to above twenty degrees, which is cool enough to be refreshing, but not cold enough to give you a shock when you dive in, and certainly not cold enough to put you off from having a swim. By mid-summer the sea will be about as warm as a swimming pool at 25 degrees, which is a pleasurable bathing temperature – which is just as well, as with the summer temperatures, you’ll be needing to take a dip in the sea regularly to keep yourself cool. The Ionian isn’t one of the most popular (if not the most popular) cruising areas in Europe for no reason: it has fine weather, plenty of islands to explore, and brilliant and reliable winds. In summer, the winds tend to be between Force 3 and Force 6, which is optimal for filling the sails and getting the sense of exhilaration that only heeling over in a big boat out at sea can bring. Those wind speeds also mean you should be able to make a decent way, and it’s not unthinkable to get over eight knots out of the winds when it’s a good day. The reliable winds also help to keep sailors cool when they’re out at sea. Every so often the winds can be a little light or heavy, but the prevailing winds usually return after a couple of days, max. The prevailing summer winds arrive from the North, following the coastline down from Croatia, past Corfu, and whistling through the Ionian islands. If you’re heading towards Patras from Kefalonia, you might also notice some winds arriving from the West, which will shoot down the channel to the Saronic gulf. Outside of the sailing season, there isn’t really a prevailing wind or weather system, and winds can arrive from the cold mountains to the North or the tropical areas to the South of the Mediterranean, so it’s worth taking kit for all seasons and eventualities. What is the Current Weather in Kefalonia? 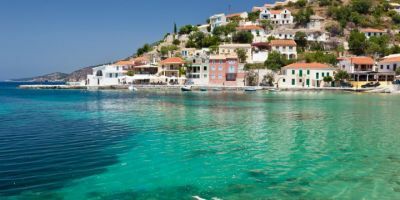 Kefalonia is the largest of the Ionian islands in Greece, and is a busy tourist destination – particularly in summer, when temperatures are dependably over 25 degrees and there are a myriad of beaches to explore. The island is probably most famous for being the setting for Louis de Berniere’s Captain Corelli’s Mandolin and the island was used as the main shooting location for the film version of the story – the cast and crew stayed in Sami, and a lot of the film was shot there (so it’s worth watching it before you go). If finding a beautiful beach is more your thing, then there’s also a startling number of great places to park your towel in the area, and there’s naturally an amazing sunset to be observed on the clear horizon if you find the right place to sit. The island also houses a famous ruined castle of St George, which is now over 1,600 years old. 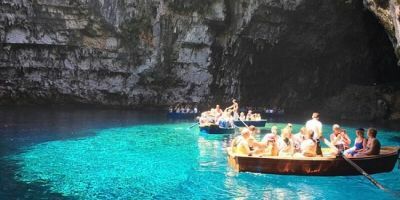 There are also many natural wonders to enjoy on the island – you can climb high to get excellent views over the Ionian, or, better, head underground, where there are all manner of caves (with colourful stalagmites and stalactites), breath-taking underground lakes, and even swallow holes which go right under the island (water takes about two weeks to get through them). A short walk from Sami is the Cave of Melissani, where there’s a funky light effect around mid-day, and the water turns neon blue. Legend has it that a fairy/nymph drowned in the water here after she was left heartbroken after another nymph spurned her romantic approaches. Sami is quite a quiet middle-class tourist town for much of the time, and the main events of the year tends to be around religious events, when the locals take to the streets for parades to and from the local churches. Orthodox Easter in particular is a time for large-scale celebrations right across Greece. To keep tourists entertained during the summer months, the Eortia festival runs from June to September in Sami, and sees a weekly programme of local folk songs and dance around the village, usually for free, and often with the aim of getting tourists to also get involved and give it a go (so be brave!). There’s also a small ‘Saristra’ music festival which takes place a few kilometres outside of Sami at the start of August, which showcases local Kefalonian and Greek bands, plus cinema screenings, lectures, group Yoga exercises, and activities for kids. Taka Taka Mam – located just opposite the port, this place does the best Gyros in town, and probably the island. If you don’t know what a Gyros is, then you need to sort yourself out and head here pronto. They also do other grilled meats (Miaouli 2, Sami). Rahati – This place does brilliant grilled meats and grilled fish, with good sized portions and at a decent price, so it’s no wonder that it’s popular with the locals. People rave about their Meze’s, and their kebabs are worth writing home about, but they also have a great range of local wines (Souliou 8, Sami). Il Familia – The best restaurant in Sami, which specialises in serving the tastiest and freshest fish and seafood. They have a waterfront location, and looking out to Ithaki island at sunset is truly magical, particularly with a bottle of house red and a grilled Red snapper in front of you (Miaouli 38, Sami). The nightlife isn’t wild in Sami, but it can get quite lively if the right bunch of tourists are in town at the same time, or if the right band is playing. There’s so many people here on holiday that you can sense the goodwill and happy feelings about the place, and everyone seems to be in a good mood. Antisamos beach bar – we’re suckers for beach bars, with their relaxed vibe, amazing views and (usually) tasty cocktails. This is one is even better because it’s one of the best beaches in the Ionian and it’s usually lively enough to be fun, but quiet enough to get a seat. The perfect place to relax during the day or early evening (Antisamos beach, Sami). Cosi – this place has a five-hour happy hour to get you into the right mood to party, and is a majestic place to sit around sunset (but there are better places to eat, so don’t be tempted to buy anything more substantial than an ice-cream here) (Miaouli 8, Sami). Willy’s bar – a quiet bar a little off the beaten track. Relax in their garden and enjoy their music whilst sipping something refreshing. Perfect for hiding from the afternoon sunshine (Miaouli 2, Sami). Remezzo Apartments – c. £35 for a double room – located just 300m from Sami port, this is a basic but comfortable place to spend the night in the heart of Sami village (and within very easy walking distance of some beaches). Each apartment has it’s own cooking facilities and a balcony. Penelope Villas - c. £140 for a double room – the best apartment complex in the area, this spacious luxurious villa is located on the outskirts of Sami, in the quiet but beautiful countryside, and with it’s own pool. If you can’t relax here, you can’t relax anywhere. Sami port is, as the name suggests, the main port for the village of Sami, which means you’ll be able to watch fishing vessels and ferries going about their business from the deck of your yacht or catamaran. It’s also only a few hundred metres to a fabulous beach at Antisamos. Being a port, there aren’t all the facilities you’d expect from a yacht marina. You’ll have to have showers on board, but there are public toilet facilities in the port, and the port is right in the middle of the village, which means you can almost literally hop off your boat and into a shop, bar or restaurant. The port offers great shelter in the prevailing summer winds, and one of the beauties of chartering from here is that there aren’t hundreds of other charter boats, so it really feels like you’re sailing well off the beaten track. Being on a remote island, there aren’t a plethora of places to get your provisions from, and you certainly won’t find a hypermarket in town. The best supermarket in Sami is about 100m from the port and is the Euromarket on EO Argostoliou Samis. Sami is 35km from Kefalonia airport, and whilst the journey involves driving on winding roads from the East to West side of the island, a taxi can do it in about 35 minutes. We can organise you a private transfer to meet you at the airport and whisk you straight to the marina – just ask. It is technically also possible to get to Sami via public transport if you have the patience for it, and your flights are well-timed for coinciding with the maximum four buses a day which make the journey across the island. You’ll need to take a bus from the airport to Argostoli bus station and change there for a bus to Sami. The shortest possible time you can make the journey in is two and a half hours, but check the timetable.